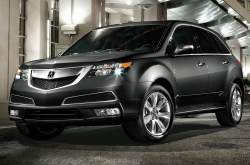 Acura of Peoria your source for 2013 MDX research and reviews. Stop worring about your next Acura purchase; look to the leading MDX dealership in Phoenix for well researched reviews authored by automotive enthusiasts. Once you begin to read, you'll find that this article is loaded with beneficial features and information. Good luck in your search! Compare the 2013 Acura MDX next to vehicles like the 2013 Buick Enclave, Ford Flex, Lexus RX 350 and the BMW X5, and you'll see that the MDX beats out the competition in quite a few areas. Scan our Quick List below to find out why! Acura of Peoria's car repair men have served Phoenix for years with amazing workmanship and trustworthy Acura parts. To keep your Acura in athletic condition, put it in the hands of Acura of Peoria's auto repair old pros. Just a chunk of the jobs our Acura repair men do includes serpentine belt replacement, engine repair and easy quick oil and filter changes. It's easy as ABC: If you want old pros service and budget repair prices in Phoenix, make Acura of Peoria your first stop for Acura vehicle maintenance. Click under this text to look up the latest coupons with unreal savings!